While visiting Hed Cycling’s headquarters in MN, I glimpsed what I thought might be a prototype for a new time trial base bar, based on their Black Dog Flat Bar. Not exactly. Turns out that they were slapping sections of carbon skin from the Jet series aero wheels to the base bar to make it conform to the 3:1 aspect ratio rule in case the UCI technical committee decided to move up the date of enforcement. On the eve of the Tour of California, team mechanics and riders nearly had a heart attack when rumors spread that the UCI would enforce a rule that requires that the sections of bicycle components not exceed 3:1 for depth to length. A simplified version of this rule has been applied to bicycle frames and forks for years, but the UCI now intends to apply a more stringent definition that would effectively ban many existing time trial handlebars and even frames. Riders and teams spend a lot of time and money choosing the best equipment and dialing in the riders position; the new rule could have negated all of that work. Riders were afraid that they could roll up to the start of the time trial only to be told that they couldn’t ride the very same bike they used the previous time trial last year. In the end, the UCI clarified that they would be merely making observations rather than enforcing the sweeping rules early. But the professional teams were in a panic, and Hed needed a contingency plan. 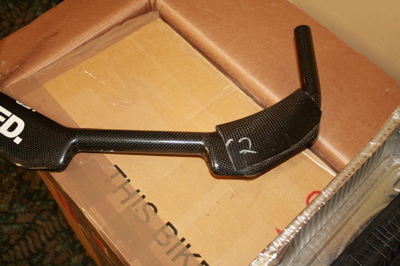 So they bonded section of carbon to their existing bars to increase the depth of the sections, thus the aerobar would technically pass the rule. 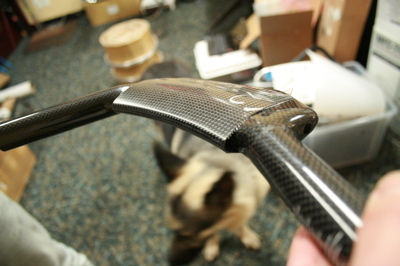 In other words, the bar would have a non-structural fairing to make it less aerodynamic. Yeah, that’s keeping the sport pure, thanks UCI. So will pro riders be riding these bars soon? Hopefully not, as Hed and doubtlessly other manufacturers are developing new designs that will meet the revised rule.